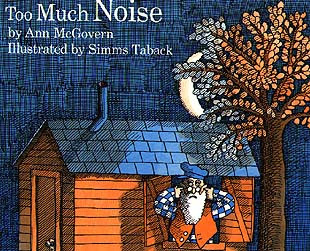 See, the next time someone scoffs at children's books as mere trifles (mmmm, trifle), I shall point them to your political review of Too Much Noise. Yes, please send them my way... and I hope they like knuckle sandwiches and roundhouse kick pudding! Something seems to have been way overlooked. Remove all the animals from the house and what do you have left? A whole lot of crap. Peaceful and quiet crap, maybe, but still a lot to shovel up. It's gonna take a whole lot of febreeze to mask this one.